Niharika’s on Residency Road is your go to boutique for Indian, and Indo Western outfits for fancy events and extra special occasions. It’s either wedding or festive season somewhere in the country, and as a population that needs just the smallest of reasons to celebrate, we’re constantly updating our “festive” wardrobes with trendsetting outfits. While taking our design to our trusted tailor at Commercial Street will always be an option, for times when you’d rather just let someone else take the reins when it comes to design, Niharika’s on Residency Road is a great option. 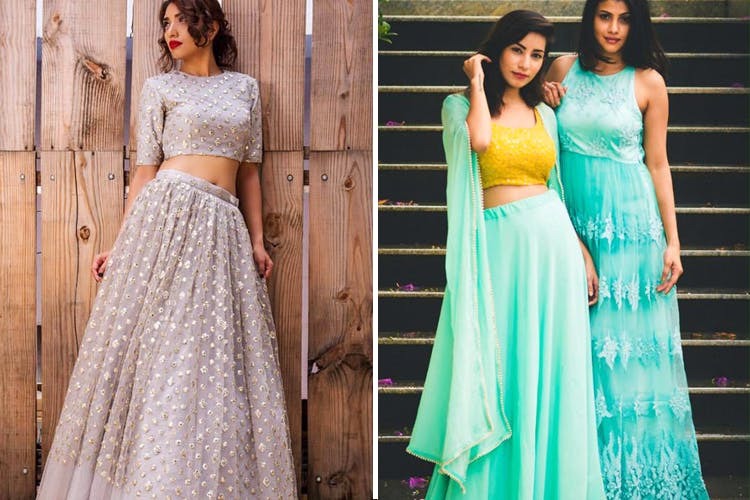 While the boutique is recent, Niharika has been designing clothes for years now. For grand affairs and events where you want to leave a lingering impression with your outfits, Niharika has you covered (pun intended). Seriously, her designs have been worn by big names in the South Indian film industry, as well as graced the catwalk at Bangalore Fashion Week so rest assured she knows how to make it grand. Of course she’ll be more than happy to create simple, elegant pieces too. Be it outfits that are fit for weddings, parties that need you screaming “bling it on”, or nature inspired outfits that look like works of art in sharp or flowy cuts, she doesn’t disappoint. The rates depend entirely on the design, and are tad cheaper if you bring your own material (she loves a challenge, and enjoys working with perspectives different from her own so she’ll make it work with what‘s provided). Her forte is Indian and Indo-Western design, but she’ll be happy to accommodate Western designs upon request. The charges are slightly steeper than the average boutique, so we suggest going to her for a consultation, and getting your dream outfit created for something extra-special like your own wedding, or milestone event.